Definition at line 37 of file strategy.hpp. forwarder a reference to the forwarder, used to enable actions and accessors. Strategy subclass constructor should not retain a reference to the forwarder. Definition at line 142 of file strategy.cpp. It is permitted to register the same strategy type under multiple names, which is useful in tests and for creating aliases. Definition at line 48 of file strategy.hpp. This function finds a strategy type using same rules as create , but does not attempt to construct an instance. Definition at line 85 of file strategy.cpp. Definition at line 91 of file strategy.cpp. Referenced by nfd::strategy_choice::StrategyChoice::insert(), and nfd::strategy_choice::StrategyChoice::setDefaultStrategy(). Definition at line 107 of file strategy.cpp. Definition at line 113 of file strategy.cpp. The strategy name is defined by the strategy program. It must end with a version component. The instance name is assigned during instantiation. It contains a version component, and may have extra parameter components. Definition at line 110 of file strategy.hpp. Referenced by nfd::strategy_choice::Entry::getStrategyInstanceName(), and nfd::strategy_choice::StrategyChoice::insert(). Implemented in nfd::fw::SelfLearningStrategy, nfd::fw::BestRouteStrategy2, nfd::fw::AccessStrategy, nfd::fw::asf::AsfStrategy, nfd::fw::MulticastStrategy, nfd::fw::NccStrategy, and nfd::fw::BestRouteStrategyBase. Reimplemented in nfd::fw::AccessStrategy, nfd::fw::asf::AsfStrategy, and nfd::fw::NccStrategy. Definition at line 153 of file strategy.cpp. References nfd::face::Face::getId(), ndn::Data::getName(), and NFD_LOG_DEBUG. Definition at line 161 of file strategy.cpp. References nfd::face::Face::getId(), ndn::Data::getName(), NFD_LOG_DEBUG, and sendData(). This trigger is invoked when an incoming Data satisfies exactly one PIT entry, and gives the strategy full control over Data forwarding. The Data has been verified to satisfy the PIT entry. A strategy should return Data to downstream nodes via sendData or sendDataToAll. A strategy can modify the Data as long as it still satisfies the PIT entry, such as adding or removing congestion marks. A strategy can delay Data forwarding by prolonging the PIT entry lifetime via setExpiryTimer, and forward Data before the PIT entry is erased. A strategy can collect measurements about the upstream. A strategy can collect responses from additional upstream nodes by prolonging the PIT entry lifetime via setExpiryTimer every time a Data is received. Note that only one Data should be returned to each downstream node. In the base class this method invokes beforeSatisfyInterest trigger and then returns the Data to downstream faces via sendDataToAll. Definition at line 171 of file strategy.cpp. References beforeSatisfyInterest(), nfd::face::Face::getId(), ndn::Data::getName(), NFD_LOG_DEBUG, and sendDataToAll(). 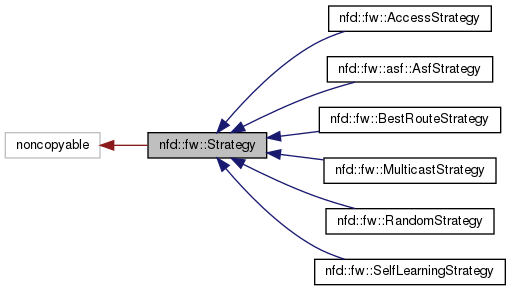 Reimplemented in nfd::fw::SelfLearningStrategy, nfd::fw::BestRouteStrategy2, nfd::fw::asf::AsfStrategy, and nfd::fw::MulticastStrategy. Definition at line 183 of file strategy.cpp. Definition at line 191 of file strategy.cpp. References nfd::face::Face::getId(), ndn::Interest::getName(), and NFD_LOG_DEBUG. Definition at line 241 of file strategy.hpp. 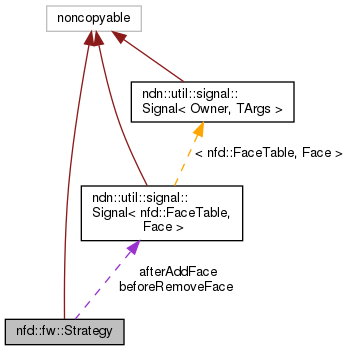 Referenced by nfd::fw::BestRouteStrategyBase::afterReceiveInterest(), nfd::fw::NccStrategy::afterReceiveInterest(), nfd::fw::MulticastStrategy::afterReceiveInterest(), nfd::fw::BestRouteStrategy2::afterReceiveInterest(), and nfd::fw::NccStrategy::doPropagate(). Definition at line 197 of file strategy.cpp. Referenced by afterContentStoreHit(), and sendDataToAll(). Definition at line 209 of file strategy.cpp. References nfd::face::Face::getId(), ndn::nfd::LINK_TYPE_AD_HOC, ndn::time::steady_clock::now(), and sendData(). Referenced by nfd::fw::SelfLearningStrategy::afterReceiveData(), and afterReceiveData(). This helper function sets the PIT entry expiry time to zero. The strategy should invoke this function when it concludes that the Interest cannot be forwarded and it does not want to wait for responses from existing upstream nodes. Definition at line 273 of file strategy.hpp. Referenced by nfd::fw::BestRouteStrategyBase::afterReceiveInterest(), nfd::fw::NccStrategy::afterReceiveInterest(), nfd::fw::MulticastStrategy::afterReceiveInterest(), nfd::fw::asf::AsfStrategy::afterReceiveInterest(), nfd::fw::BestRouteStrategy2::afterReceiveInterest(), and nfd::fw::SelfLearningStrategy::afterReceiveInterest(). The outFace must have a PIT in-record, otherwise this method has no effect. Definition at line 286 of file strategy.hpp. Referenced by nfd::fw::MulticastStrategy::afterReceiveInterest(), nfd::fw::BestRouteStrategy2::afterReceiveInterest(), nfd::fw::SelfLearningStrategy::afterReceiveInterest(), and sendNacks(). This is not an action, but a helper that invokes the sendNack action. Definition at line 231 of file strategy.cpp. Schedule the PIT entry to be erased after duration. Definition at line 306 of file strategy.hpp. Definition at line 253 of file strategy.cpp. References ndn::DelegationList::empty(), nfd::fib::Fib::findLongestPrefixMatch(), nfd::Forwarder::getFib(), ndn::Interest::getForwardingHint(), nfd::pit::Entry::getInterest(), nfd::Forwarder::getNetworkRegionTable(), nfd::fib::Entry::getPrefix(), nfd::NetworkRegionTable::isInProducerRegion(), and NFD_LOG_TRACE. Referenced by nfd::fw::BestRouteStrategyBase::afterReceiveInterest(), nfd::fw::NccStrategy::afterReceiveInterest(), nfd::fw::MulticastStrategy::afterReceiveInterest(), nfd::fw::asf::AsfStrategy::afterReceiveInterest(), nfd::fw::BestRouteStrategy2::afterReceiveInterest(), nfd::fw::SelfLearningStrategy::afterReceiveInterest(), nfd::fw::SelfLearningStrategy::afterReceiveNack(), and nfd::fw::NccStrategy::doPropagate(). Definition at line 318 of file strategy.hpp. Referenced by nfd::fw::NccStrategy::beforeSatisfyInterest(), nfd::fw::NccStrategy::getMeasurementsEntryInfo(), and nfd::fw::NccStrategy::timeoutOnBestFace(). Definition at line 324 of file strategy.hpp. Definition at line 330 of file strategy.hpp. Definition at line 122 of file strategy.cpp. References ndn::Name::getPrefix(), ndn::Name::getSubName(), nonstd::optional_lite::nullopt, and ndn::Name::size(). Referenced by nfd::fw::asf::AsfStrategy::AsfStrategy(), nfd::fw::BestRouteStrategy::BestRouteStrategy(), nfd::fw::BestRouteStrategy2::BestRouteStrategy2(), nfd::fw::MulticastStrategy::MulticastStrategy(), nfd::fw::NccStrategy::NccStrategy(), and nfd::fw::SelfLearningStrategy::SelfLearningStrategy(). If input contains a version component, return input unchanged. Otherwise, return input plus the version component taken from strategyName. This allows a strategy instance to be constructed with an unversioned name, but its final instance name should contain the version. Definition at line 133 of file strategy.cpp. References ndn::Name::at(), ndn::name::Component::isVersion(), ns3::ndn::Name, ndn::Name::rbegin(), and ndn::Name::rend(). This must be called by strategy subclass constructor. Definition at line 367 of file strategy.hpp. Definition at line 383 of file strategy.hpp. Definition at line 384 of file strategy.hpp.